The frame was sold by the Danish Bakker agent in 1983 and was first equipped with a GS750 Yoshimura Engine and Campagnolo Wheels, see Picture of the bike with original looks. 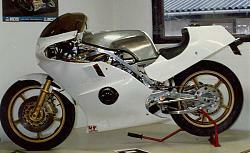 1987 or 88 it was rebuilt with GSXR750 Engine and PVM Wheels and it still runs with that setup. Original fairing is missing, now it is a new Suzuki XR41 fairing. Seat is a copy of the original bakker model.. I have raced it only once but it is not for me, to fast and to good, I can´t take to the limits as with older bikes I race and I´m not really interrested in doing that with this bike. It needs a faster rider than me. That is why we tried with another rider and Peter Lindén won the first race out with this bike against the top Scandinavian drivers and he did it with 750cc and treaded tyres against 1100-1200cc bikes with slick tyres. The Bakker has had a big service, been taken to pieces and put together again. I do not know much about the engine, it runs well and is fast and powerful. I have only serviced it, checking valves, oil changes and so on. When I raced the Bakker once last year in Formula 80-87 it was as fast on the straights as the fastest bikes in Scandinavian and those are mostly 1000-1200cc. The low weight of 158 kg helps but it would not run with a 145 hp GSXR1100 if it wasn´t a good engine in it. The frame is made in aluminium and has frame number NB003 and I guess it is the third aluminium frame made by Nico Bakker but I don´t know fore sure. The frame is made of 5-6 parts that are bolted together. Rear Ohlins shock has only been used for one weekend after service at the factory..
Front fork is 1988 43mm GSXR750, brake calipers are GSXR600 1999 but 1988 type calipers comes with the bike. New ISR discs, only used one weekend. This bike has always been a racebike, no registration documents. Tested and ready for race.